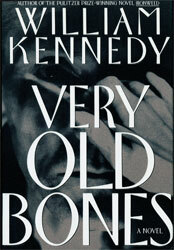 In his review of Very Old Bones in The Recorder in 1992, the critic Noel O’Hara wrote, “We realize it is the commerce of Kennedy’s novels with the past and future that makes the Phelans profoundly different from the Karamazovs and the Compsons. There is no longing for a lost past of God-given opportunities, as there is with Faulkner, no sense of historic decadence whose state is the present of the Karamazovs, through whom Dostoyevsky probes the destiny of man in the light of his own Christianity … The meaning this novel distills from the whole cycle is that the past is darkness and the future is the possibility of light." ". . . the novel has about it a crisp, authoritative ease—as though the truth were just hiding there on the outskirts of Albany. . ."
Very Old Bones was published in Brazil, Denmark, France and Portugal.